Simply by adding a new bathroom on the upper level of your house, you would be able to add more value to your property. Apart from that, you will also provide convenience to the people living in the house. A good layout plan should be made before you embark yourself with this task. You need to consider lot of things in the plan that you need to prepare such as the available space on your upper level, the current rooms, your house layout, the budget that you have and also your house theme. In order to setup plumbing of a new bathroom, the most important part is for you to attach the supply water pipes and drainpipes of your existing systems before you start to think about decorating the bathroom according to your liking. Below are some of the tips that you can learn before you can start the project. First thing that you need do is to make connection to your existing drain lines. You must also make sure whether you need a permit or not from your local authority for adding a new plumbing to your house. Contact them to confirm the issue before starting any of the tasks. Always explore whether there are any available area suitable to accommodate your new bathroom on the upper level of your house. You can also make use of unused room like an extra bedroom, box room as well as the attic. 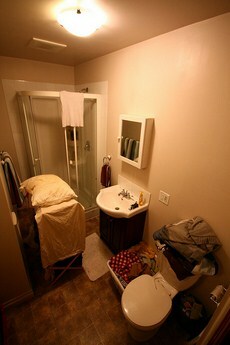 Utilize any of the room and plan out carefully on how to fit in your bathroom facilities into the room. If the room is too small, you can simply accommodate a toilet together with a small sink rather than installing a bathtub or shower. Then, you need to get rid of the drywall in your bathroom which has the nearest access to your existing drain lines especially if you do not have direct access to plumbing within the access panel near the room. In order to disassemble the drywall, you can use a reciprocating saw along with a drywall blade. Make sure that you take out the drywall in smaller parts before discarding them. Next step that you have to do is to find the drain line inside the wall panel. Before starting your work, you must shut off the main water line ball valve in a clockwise manner of 90 degrees so that the water flow to your entire plumbing system will be halted. After that, you have to open all the faucet taps that you have inside your house so that you can drain any of the water still exist from the drain lines. Then, you need to take a hacksaw or pipe-cutting tool to cut out a 5-inch section of the waste line. Once finished doing the above step, you can proceed by applying a layer of the ABS cement to the inside of an ABS Y-coupler. Next, you have to press the coupler right into the hole that you made earlier in the drain line. You must make sure that the fitting managed to slips over both of the pipe’s end. The opening on the Y-fitting should be pointed toward the inside of your bathroom in order for allowing easy access in future. You must also let the cement to set for at least 10 minutes and right after it has dried thoroughly, you will be using the Y-fitting to connect the sink with the toilet drains. Next step that you need to take is to locate your existing hot and cold water lines which is the nearest to your bathroom. The water lines are normally located inside your basement, crawlspace or access panel. In order for you to connect the supply lines, the first thing that you should do is to create a 5-inch section mark on the water lines of your hot and cold water supply. Next, you have to cut along the marks that you have created by using a pipe-cutting tool or hacksaw. You need to remove any plastic or copper shavings of the cut pipes. Clean them just by using a cloth. On one side of each of your supply lines, you need to place push-to-fit T-fittings where the third opening will be facing the direction of your bathroom. In the end, the fitting will snap accordingly in place. After that, lightly pull on the fitting’s back along with the other side of your cut pipe so that you can slip the pipes into the other side of your fittings. Then, gently release the fitting together with the pipe in order for you to complete the connection. The new water pipes should be thread into the wall in the same path of your bathroom. Next, you need to place in the pipes base into the openings on your T-fittings so that you would be able to connect the water lines to your existing plumbing system. It is advisable to have a friend to help you steer the top of the pipes right into the opening located in the wall of your upstairs bathroom. Make sure that you secure the tops of the pipes temporarily against the stud in the wall. Place a pipe strap around each of the line before you proceed to tap the nails into the studs. By doing this, you would be able to hold the lines intact before you start to add furniture as well as other fixtures to the bathroom. You need to set aside a budget for the entire project. Get some ideas by looking at your local bathroom outlets to find out the prices of the materials and items that you want to purchase or use. Make sure you calculate your own budget that you would like to spend on the project against the market prices. It is recommend that you seek some advice from experience people like an architect, professional contractor or plumber especially in terms of rules, regulations and safety related to the project. Make sure that the connection of your existing pipe lines are in good condition and will not cause any problems when you start to do the project. You also need to install an exhaust fan if your new bathroom is small and only have small window and provide you with little ventilation when in usage. The fan will help absorb the steam and condensation of the room. This entry was posted in Home Improvement on April 9, 2012 by Mike.